Anglesey has it all! Its 125-mile coast boasts challenging and calm waters, one of the world’s biggest tidal reaches in the Menai Strait, and beaches, coves, harbours and cliffs galore. It’s home to the Round Anglesey Race and a number of seafood festivals. Holyhead Marina, the island’s main port, can be entered in all weather conditions and at all states of the tide while the local authority operates public launches all round the island. The waters off Holy Island, at the western tip of Anglesey, rival any sea paddling and coasteering destinations in the world. The varied coastline offers beaches, piers, jetties and rocks which are ideal for shore fishing, and there are also many established points right across the Island. The variety of catch is wide and varies throughout the seasons. Wherever you are on Anglesey, the mountains of Snowdonia make a spectacular backdrop. 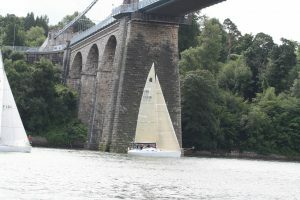 No more so when cruising along the Menai Strait, where the country’s highest mountains vie with a historic suspension bridge (once the highest in the world) for your attention. Keep your focus here, though – in parts the Strait is a notoriously dangerous stretch of water!